compromise between Local Breakout and Home Routed roaming scenarios. reducing both network complexity and routing. of PGW in the regional breakout center. Carrier Breakout gateway in coordination with the carrier’s home PCRF. 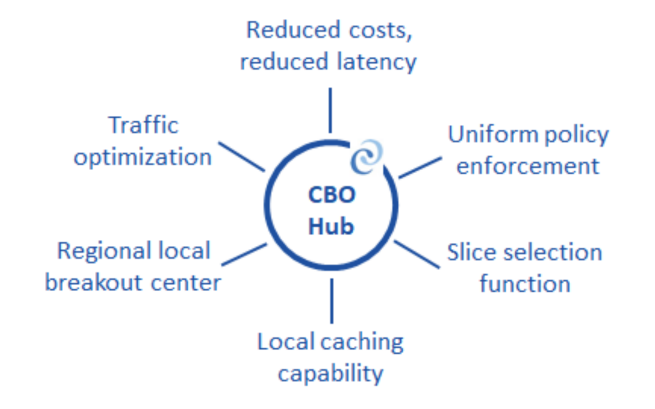 CCN’s Slice Selection Function (SSF) can be deployed at the CBO Hub, allowing for network slicing. The SSF uses control plane and policy information to identify and steer traffic to specific gateways. This network slicing allows the creation of multiple virtual networks on top of a shared physical infrastructure. CCN will build and manage your network…while you build and manage your business.